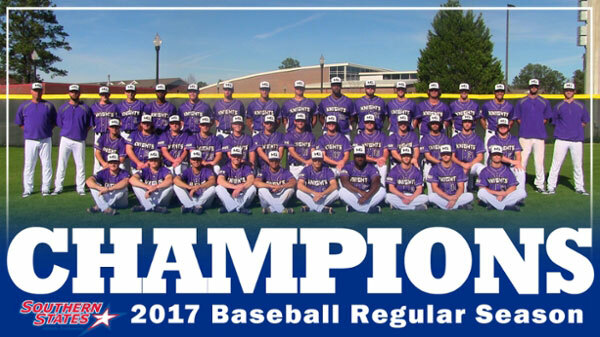 In spring 2017, baseball became the first Knights athletics team to win an SSAC championship. Three years ago this fall, Middle Georgia State accepted an invitation to join the National Association of Intercollegiate Athletics. While the Knights initially struggled on the playing fields and courts, which was to be expected, MGA's student-athletes began accumulating academic awards from the beginning, including several who were named NAIA Scholars and others named to All-Academic teams. The overall athletics program earned an NAIA Champions of Character Silver Award its first year in the association. The NAIA gives Champions of Character awards annually to institutions based a scoring system that measures the community involvement, academic success, and conduct and character of athletes. Knights teams became more competitive after the first NAIA year. Women's soccer became MGA's first ranked team in the NAIA. Knights baseball became the first MGA team to win a conference championship, while men's and women's tennis both ranked in the top 25. In all three years, the percentage of student-athletes making the President's or Dean's lists on the basis of grade point average was more than double that of the general student population. "Overall, our move to the NAIA has resulted in more recognition for the athletics program and the University as a whole," said James Hagler, associate director of Athletics and Recreation, who played a key role in the transition. "One of the most significant changes has been the number of opportunities we can now give to student-athletes. In earlier years we had a total of about 100 student-athletes playing on various teams. Now we have more than 180 competing in 10 sports. They come from 10 different states and represent 19 different countries." What is now Middle Georgia State University was created in January 2013 when Middle Georgia College, a two-year school in Cochran, consolidated with Macon State College, a baccalaureate institution. Unlike Macon State, Middle Georgia College had an athletics program that competed in the National Junior College Athletics Association. Middle Georgia College athletics had a long record of competitive success at the junior college level, especially in baseball. So an essential part of Middle Georgia State's growth was figuring out how to maintain that tradition as part of a university-level athletics league. As a first step, students of the previous institutions chose a new mascot - Knights - and school colors - purple, black and silver/gray. About a year later, in fall 2014, Middle Georgia State joined the NAIA, which is the governing body of small athletics programs that "are dedicated to character-driven intercollegiate athletics." Shortly afterward, Middle Georgia State joined the Southern States Athletic Conference, one of the NAIA's 21 conferences.Knights baseball captured the SSAC championship earlier this year. In other significant moves, Knights athletics added teams in women's volleyball and cross-country. The program again earned the Champions of Character Silver Award in 2016. Just recently, MGA hired a new athletics director, Chip Smith, who has served in various capacities with the athletics departments of University of North Carolina Charlotte, Western Carolina University, Morehead State University, Eastern Kentucky University, and Virginia Military Institute. Smith said his goals for the coming year include helping Knights teams improve competitive performance in the SSAC and in NAIA post-season play. He is working to raise revenue for the program though the newly formed Knights Athletic Association and through advertising and sponsorship packages. "We're also working to earn status as a Gold Star institution in the NAIA Champions of Character program," Smith said. "The most important job we have is working to instill character and build values among student-athletes." This article was originally published in the fall 2017 issue of MGA Today magazine.